Deep cuts! 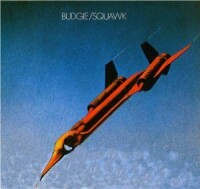 Hardly known at the time outside of the U.K (and beat to the punch by Sabbath and Savoy in their own country), Budgie were heavy and hard, furthering forms adopted by metallers and rockers anywhere from Iron Maiden to Black Flag. Comparisons are also drawn to the progressive tendencies of Rush, but I hear more vocal work akin to Geddy than anything else at this point in their trajectory. “Squawk” is more of a solid hard rock slab, a bit cleaner than Blue Cheer, but more straight ahead, a real stoked engine. Also hear some Savoy Brown… Chimes appear hear and there, keyboards on occasion, and acoustic numbers seem to be overlooked in other write-ups.